It’s — Ferrari 250 GTO 1962 model year. Its cost — nothing at all, 28.5 million dollars. The machine is capable of much. Maximum speed — 280 km / h. Dispersal to hundred km / h in 6 seconds is available. Engine — 2953 cm3 and 302 hp this car Weight 1100 kg. And now a bit of history about this instance. The car was produced from 1962 to 1964. The main aim of all models «250» was not just the participation in the race, but also a complete victory. In total there were about 20 modifications of this stallion. 250 is a cubic volume of the engine cylinder, GTO — Gran Turismo Omologata. A total of 36 cars were created. 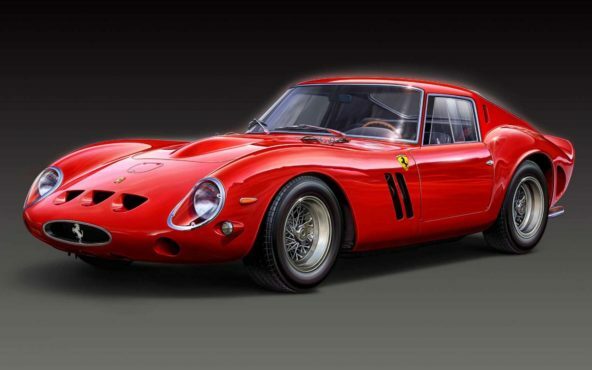 It was the Ferrari 250 GTO — a real race for collectors. Do not forget about the achievements of this unit. 1962, 1963, 1964 remember the full victory in the race World Manufacturer`s Championship. racing series «24 Hours of Le Mans» remembered honorable second and third place. More cars with a front-engine Ferrari developers are not allowed. Its price is fully justified, because the machine has perfect everything from appearance, and ending any trifles. Here they are, the most expensive car in the world. Although each instance, and has a number of features and benefits, but they are created for collectors rather than for those who live their lives in constant trips. Just imagine, how much can it cost to repair or tuning cars. For any machine, no matter how much it may be gold or diamonds, a small micro-scratches and abrasions during operation. Because imagine yourself traveling on one of the ten best cars only in dreams. Do not be upset that you are not a happy owner of a billion. After all, not a single car is calculated simple human happiness. But you know that everywhere has a fly in the ointment? These machines want to admire and marvel, but to go to them constantly makes no sense. We hope our rating to expand your horizons and give new knowledge, or an occasion for reflection.